Phonological awareness is a key skill in developing a child’s speech and reading skills. Check out Helen’s post about it here. As Helen said, phonological awareness includes a range of skills, including rhyme, but they all involve the ability to hear and discriminate sounds in words. Many of these skills are needed before a child starts to read so we know that it is important to support them. When thinking about rhyme, there are some different skills involved. One is the ability to generate rhyming words. The other is the ability to hear and match rhyming words. Younger children (2-3 years old) start to develop an awareness of rhyme and enjoy nursery rhymes and songs. Between the ages of 3-4 years old, children start to be able to generate rhyming words. Older children then develop the ability to recognise that words rhyme and discriminate an odd one out e.g. fin, cat, pin – cat is the odd one out as it doesn’t rhyme with the others. This is when they learn about onset and rime and can break a word down into parts. How can we help younger children develop their ability to match and think of rhyming words? Sing songs and nursery rhymes: Leave a pause and see if your child can fill in the rhyming word. You can talk about words sounding ‘nearly the same’. So all those repetitions of incey, wincey, spider and five little speckled frogs have a great use! Games: Orchard toys have a few games designed to support rhyme. You can read our review of Slug in a Jug and there is a new game Rhyme Robber also available. Reading books: Many children’s book use rhyme. You can point these out as you read the stories. Apps: I have 2 apps I use regularly to support rhyme. I tend to use these with children who are finding rhyme tricky, rather than children who are still developing their skills, however they are both great apps. I have Rhyming bus by therapy box and Rhyming words – preschool matching game. Some children find rhyme tricky and it doesn’t come spontaneously. I work with a number of junior aged children (7-11 years olds) who are finding reading and spelling hard. This is because their ability to hear and manipulate sounds in words is reduced. 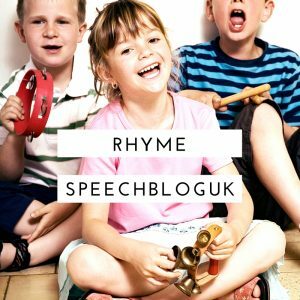 There are likely to be a number of skills in their phonological awareness that need support, and rhyme may well be one of them. With older children I often write the words down. Although they may not be confident readers, I feel the visual support is useful especially if they really can’t ‘hear’ that the words rhyme. You are actually teaching them a number of skills. If you write down ‘paw’ and then cover up the p, you are showing them how to segment the word. I will circle or underline the part of the word that rhymes. Then replace the ‘p’ with a ‘s’ and see if they can blend the s…..aw into saw. Now you have shown them how to blend. Some children will need a lot of support and repetition to achieve this and that is fine. When encouraging a child to discriminate if words rhyme I start with just 2 words. Say them clearly and see if the child can give a yes or no response to the question ‘do they rhyme?’ If they can’t, you can write the words down as in the above example. Try and use words that have different initial sounds as well. Asking if kiss and kick rhyme is really tricky as many children will say yes as the initial sounds are the same. Once a child is confident at this level, you can move onto odd-one-out type tasks. I use the two apps named above. I also have a set of magnetic letters and a magnetic whiteboard so we can make words and then remove/ change sounds. How else do you support rhyme?